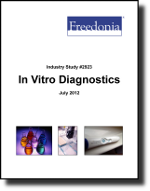 US demand for in vitro diagnostic (IVD) products will rise 6.1 percent annually to $24.7 billion in 2016. Molecular diagnostic products will grow the fastest due to their advantages in the detection of infectious diseases, tumors and genetic disorders. Hospital labs will continue to comprise the largest and most diverse market. This study analyzes the $18.4 billion US IVD products industry, with forecasts for 2016 and 2021 by product type (e.g., clinical chemistry, immunoassay, molecular diagnostic, blood testing, cellular analysis, anatomical pathology, microbiology), application (e.g., infectious disease testing, cancer testing, diabetes testing, heart disease testing, blood grouping and screening, drug testing) and market (e.g., hospitals, independent clinical laboratories). The study also considers market environment factors, details industry structure, evaluates company market share and profiles 27 industry players, including Roche, Johnson & Johnson and Danahar).